Understanding Luck: Episode 7 – Hello Race Fans! There are no shortage of places that do narrative recaps of HBO’s Luck, but that may or may not help you understand the “inside baseball” that’s going on with regard to horse racing. So, starting with the series premiere on January 29, we’re publishing a guide to help you better understand what’s going on and/or learn more about horse racing. Feeling lucky? Jerry (Jason Gedrick) does, winning a ticket to the World Series of Poker and a date with card dealer Naomi (Weronika Rosati) in this week’s episode. Lonnie (Ian Hart) has a less successful afternoon. The hapless Foray tells his friends at breakfast that he’s spotted a potential claim in race three, a gray filly who reminds him of Mon Gateau — like the Foray Stable winner, Lonnie thinks Niagara’s Fall is better than the company she’s keeping. He also tells the gang that he’s claiming her alone, which makes Marcus (Kevin Dunn) scoff and Renzo (Ritchie Coster) concerned. There are so many details to get right, he reminds Lonnie — if the horse’s name is even misspelled, for instance, the claim won’t be valid. Tracks ensure connections follow that deceptively simple rule by requiring every owner and trainer to maintain owners’ and horsemen’s accounts in their jurisdictions. In California, these accounts are overseen by the Paymasters of Purses, and it is through these accounts that all purse monies are paid and claims processed. (Other transactions, such as fines levied by the racing board and payments made to various organizations are also handled through track accounts and managed by the Paymasters.) Claims can only be entered, and accepted, if the claiming price (plus any taxes and fees) are on deposit in an owners’ account. Lonnie’s claim stands — but there’s a moment when it looks as though his new horse might not for much longer. How a jockey handles a horse injured during a race can make all the difference in that horse’s prognosis — stop a horse after a bad step, and the animal may not only live, it might race again. In 1999, Chris Antley dramatically illustrated what a difference a rider can make when Kentucky Derby and Preakness winner Charismatic suffered a fracture in the final furlong of the Belmont Stakes. The jockey leapt from his saddle and held Charismatic’s leg, broken in two places, in his hands until a veterinarian was able to apply a splint. Charismatic underwent surgery the following day — his racing career over, but his life saved. Back in the barn, Jo exams the filly’s right front leg and tells Lonnie that she won’t race again. 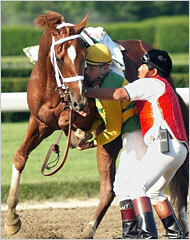 Niagara’s Fall ruptured her flexor tendon — an injury otherwise known as a bowed tendon. “You got yourself a broodmare now,” says the vet. After several rough weeks, Ronnie (Gary Stevens) is trying to get his life (and career) back in order, attending AA meetings and talking to trainer Walter Smith (Nick Nolte) about getting the mount back on Gettin’up Morning. Smith tells the jockey he plans to replace Rosie and that Ronnie can have the call on the horse, so long as he’s fit and sober. Ronnie pledges he’ll be both, but despite his desire to return to racing and the promise of such a talented ride, he can’t resist the lure of painkillers when he’s home alone later that night. If Stevens doesn’t get an Emmy nomination for “Luck,” it’ll be a shame, because the Hall of Fame jockey turned actor is doing incredible work depicting a rider’s struggle with addiction. Unfortunately, it’s a story he’s seen up close — Stevens was a friend of Chris Antley, and witnessed that rider’s fight with drugs and alcohol before his death in 2000, and he also rode the same circuit as Patrick Valenzuela, a talented jockey whose career was frequently interrupted by addiction. Substance abuse is a familiar story in racing, but there are jockeys who overcome drug and alcohol problems and succeed at the game’s highest levels, such as Hall of Famer Jerry Bailey, currently an analyst for ESPN and ABC sports, and Garrett Gomez, now one of racing’s leading riders. Possibly the only character on “Luck” having a better day than Jerry is Ace Bernstein (Dustin Hoffman), who visits the prison farm to which he gave so generously. Claire Lachay (Joan Allen) introduces him to one of the retired Thoroughbreds being cared for by the inmates, an older gelding, earner of more than half a million during his career. While many organizations exist to ensure that Thoroughbreds are safely retired from the racetrack, horses still sometimes end up in auctions where they can be purchased for slaughter. It may be years after the Thoroughbreds last raced, but groups such as the one Lachay represents on “Luck” work hard to rescue the racehorses they can from meeting that fate. Thank you so much for going into further detail about the “claims” process. I was very confused during episode 7, but you set me straight. I take it “Lonnie” had the bona fides to enter a claim without being questioned. He must have had money on account, or on file (whatever the “term” is). I can’t imagine and “average Joe” could go and put in a claim, without having a proven account with the necessary funds to cover the claim….just like in a serious auction. As an animal lover, it is just heart-breaking to know that too many horses get put down after their “useful” life has expired. Yes, I realize there are many alternatives for the “winning” horses to be sent to a farm to breed…but I imagine for every one of them, there are at least 10 or more horses that are put down, simply because they no longer are “useful”. This must truly be a dirty secret amongst the fine sport of horse racing. I imagine the situation is similar with greyhound (dog) racing…but at least in that field, there are multiple “rescue” non-profit societies. Hopefully, the greyhound “rescue” model is becoming more and more common amongst race horses. Sorry for my digression…in any event, thanks once again, for the excellent explanation of the “Claim” process. Keep up the great work. I make sure to check into this site each and every time “Luck” airs…and I always learn something new. So, all your efforts are very much appreciated.